This building was constructed in 1883 by F.M. "Borax" Smith, founder of the Pacific Coast Borax Co. 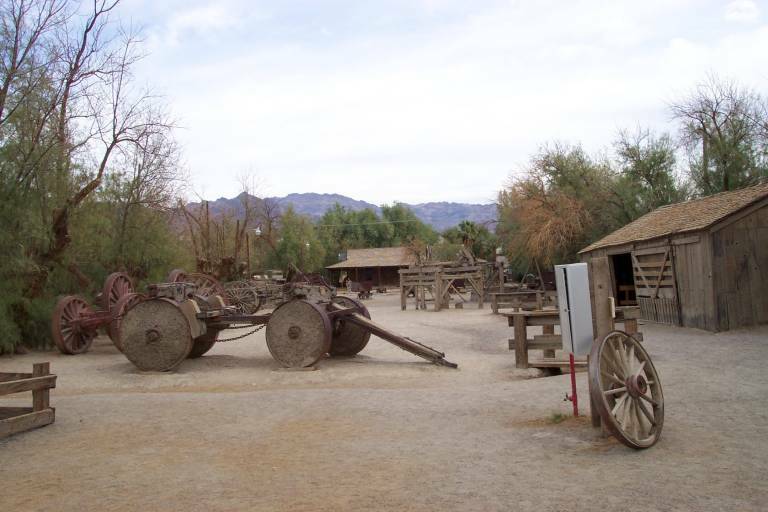 The oldest house in Death Valley, it stood originally in Twenty Mule Team Canyon where it was office, bunk house and ore-checking station for miners at the Monte Blanco deposits. 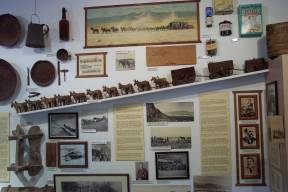 The objects within and around it were assembled by the company so that visitors to the Valley might better understand the history of the region. 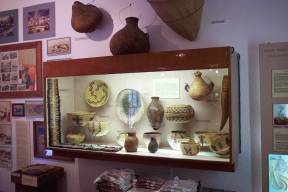 The museum is maintained in the public interest. Indians had been living in Death Valley for thousands of years before the first pioneers struggled through in 1849. The Indian name for the Valley was TOMESHA meaning ‘ground afire”. The Indians had learned that the best way to live in this area was to leave the valley during the summer. As the hot weather arrived, they followed the lines of ripening vegetation upward into the surrounding mountains where they would gather seeds and pine nuts. In the fall, they would return to the valley where the climate would remain mild during the winter. They were hunters, subsisting on small game like rabbits, squirrels, pack rats, quail, ducks and chuckwallas, and on the larger bighorn sheep when they were lucky. They gathered mesquite beans in the spring and pine nuts in the fall. They supplemented these staples with wild grapes, hupi berries, mariposa lily bulbs, Joshua tree buds, squaw cabbage greens, and the seeds of sand bunchgrass, wild rye, sunflower, and devil’s pincushion. By the mid-nineteenth century, some Indians planted gardens of corn, beans and squash around the valley springs. The home of the valley Indians was a simple domed structure ten feet across constructed of mesquite or willow branches and covered with wattled grass or brush. The mild climate made more elaborate dwellings unnecessary. The Indians of Death Valley are descendants of the Southern Shoshone tribesman who wandered westward a thousand years ago from the Great Plains and Rocky Mountains. 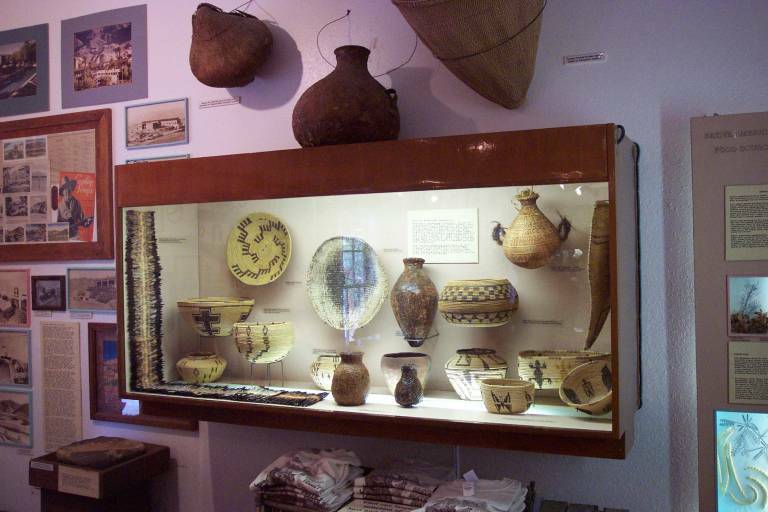 Although they have formed separate bands – Panamint, Shoshone, Coso, and Paiute – they all speak a Shoshonean dialect. 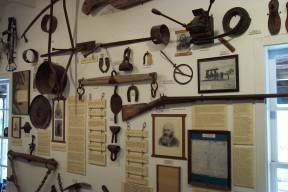 The pioneers who had accidentally stumbled into Death Valley carried more than their story of their sufferings to the settlements of California: one of them brought tangible evidence that precious metals could be found there. While searching for a way out of the Valley, Jim Martin, a member of the Bugsmashers group, pocketed a piece of shining metal from a sparkling ledge. The Georgians recognized that the rock was rich silver ore. Martin had knocked the sight off his rifle earlier on the journey and when he reached Mariposa in the gold fields, he took the piece of metal to a gunsmith to replace his gunsight. The story quickly spread of the mountain of silver crossed by Martin and his party on their way to California, and it touched off one of the west’s great prospecting booms. The sparkling ledge with the pure silver outcroppings was never found again, or perhaps was worked out and never recognized as such. But the Lost Gunsight Mine beckoned to prospectors decade after decade. Martin himself came back to Death Valley to look for it in 1862. The earliest desert prospectors found few minerals but left place names and some legends behind them. Darwin was named for a disappointed miner named Darwin French. 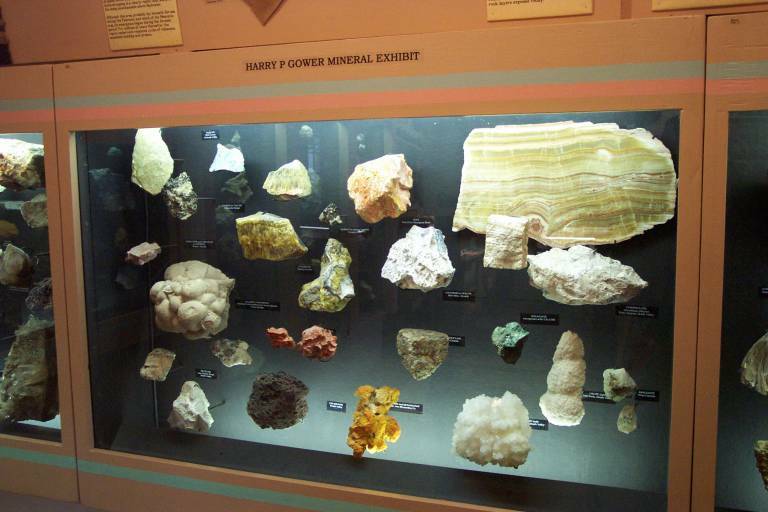 A Dr. Samuel George, of the Rough and Ready Mining Co. discovered antimony at Wildrose Canyon on Christmas Day 1860 and called it the Christmas Gift Mine. A prospector named Charles C. Breyfogle after being lost from his prospecting party for several days, returned from the Valley with rich gold ore in his hands and no memory of where he had discovered it. Thus, the Lost Breyfogle Mine was added to the lore and the lure of the region. From the 1860’s until well into the twentieth century, prospectors wandered over the desert with pick, shovel, canteen and the long-suffering burro. Although no deposit compared with the fabulous Comstock Lode in Virginia City, they found silver in the Panamints, silver and lead at Darwin, gold and silver at Keeler and in the Calicos. 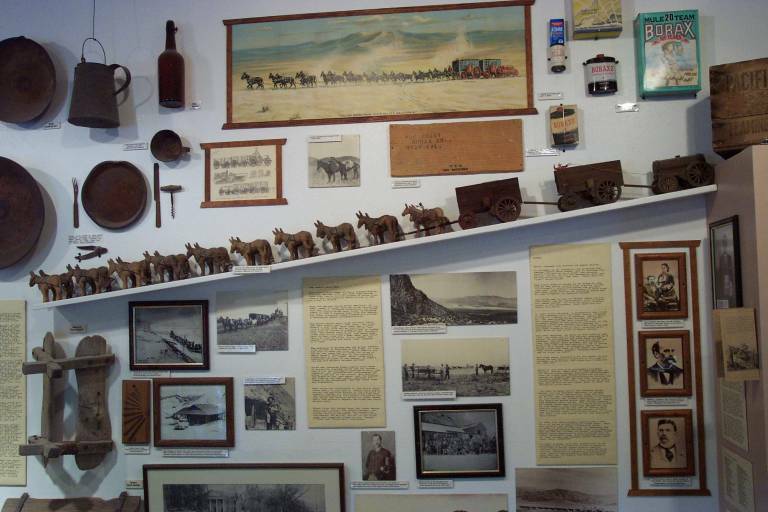 At the turn of the century, gold discoveries skyrocketed Tonopah, Goldfield, Bullfrog, and Skidoo into the boom towns. 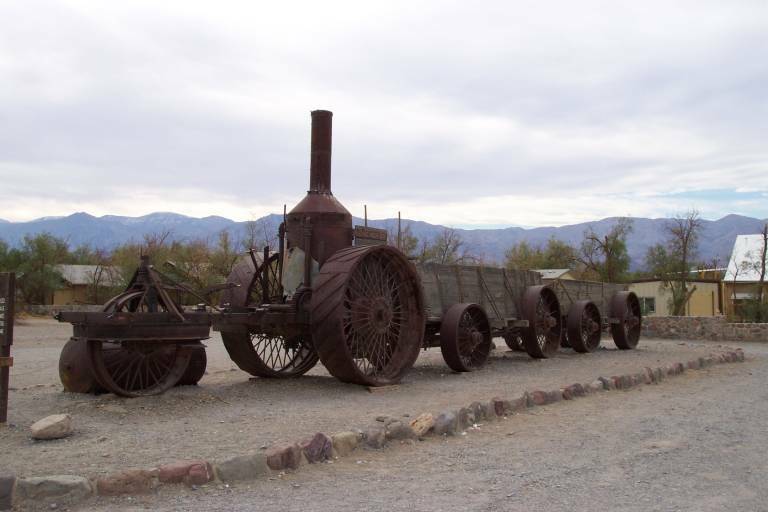 Rhyolite’s gold brought three railroads, electricity, telephones, newspapers, banks, a business district with three-story skyscrapers named Golden Street, and a population of 4000 by 1907. During the flush days, everything was ordered by the carload. But by 1910, the census takers found just 611 souls in Rhyolite. The post office closed in 1913 and the power company turned off the lights in 1916. Gold was found in Harrisburg, first called Harrisberry after Shorty Harris and Pete Aguerreberry who made the strike. Gold was also found near Emigrant Canyon at what became the Skidoo Mine, developed by bob Montgomery who had discovered the biggest mine in Rhyolite. In the valley itself there were smaller scale gold strikes at the Keane Wonder Mine and in Chloride Cliffs. Greenwater was one of the great stock mining scams of all time. Out of a few green stains of copper sprang saloons, dance halls, two newspapers, a bank, a post office, and telephone service – all the trappings of a mining boom town except the ore in the ground to pay for it! Similarly, Leadfield’s wealth was only in the stock which a few small veins of lead and silver inspired promoters to issue. Like most of its neighbors, it is a ghost town today. The prospectors who worked the Death Valley region have been as colorful as the towns that shot up around their discoveries. They were independent, adventurous, and sometimes lucky. Some of the ones who have enriched our history, if not themselves, include Shorty Narris, John Lemoigne, Johnny Mills, Shorty Borden, Jack Madison, Paddy Miles, Bob Thompson, Bill Maddick, Johnny-behind-the-gun-Cyte and, of course, Death Valley Scotty. Borax changed the history of Death Valley. 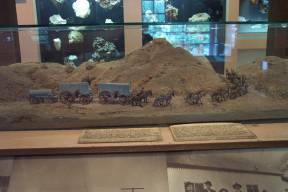 It brought in an industry; it produced the famous Twenty Mule Teams; and it focused the world’s attention on a great new mineral source, which, unlike the ephemeral gold and silver discoveries, was real. 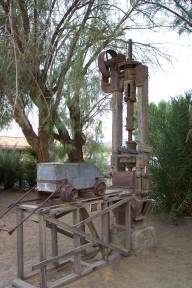 There were no “lost” borax mines. The first form of borax to be found in the Valley was white crystalline ulexite called “cottonball”, which encrusted the ancient lake bed, Lake Manly. Cottonball of this kind had been found earlier at Columbus Marsh and at Teel’s Marsh, in western Nevada. The first man to try to market Death Valley cottonball was an unsuccessful gold prospector named Daunet. In 1875 he could interest no one in his discovery. Fate made him six years too early. In 1881 Aaron Winters, a prospector who lived in Ash Meadows with his wife, Rosie, offered a night’s lodging to a stranger, Henry Spiller, who was prospecting through the desert. His hospitality was well rewarded. The stranger spoke of the growing interest in the mineral borax and showed him samples of cottonball. One look told Winters that he saw the same crystals every day, covering acre upon acre of the floor of Death Valley. And they were. Winters sold the Death Valley acres he had quickly acquired to William T. Coleman, a prominent San Francisco financier for $20,000. Word of the Valley’s cottonball quickly spread. Daunet came back in 1882 and set up the Eagle Borax Works, but quit the business when he found that borax could not be processed by simple recrystallization during the intense summer heat. By the time operations could resume in the Fall, the price of borax had fallen and he was never able to make the operation profitable. In 1882 Coleman built the Harmony Borax Works, hiring Chinese laborers to scrape cottonball from the ancient lake bed for $1.50 per day. Finding that summer processing in the Valley was indeed impossible, he built the Amargosa Borax Works near Shoshone, where the summers were cooler. The ruined remains of these three early borax plants still stand in the desert. 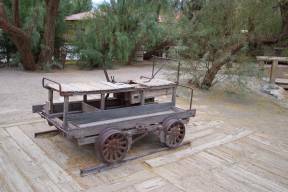 The borax was hauled to the nearest railroad by the use of Twenty Mule Teams hitched to ponderous wagons. Coleman was producing about 2 million pounds of borax per year from his Death Valley and Amargosa facilities. 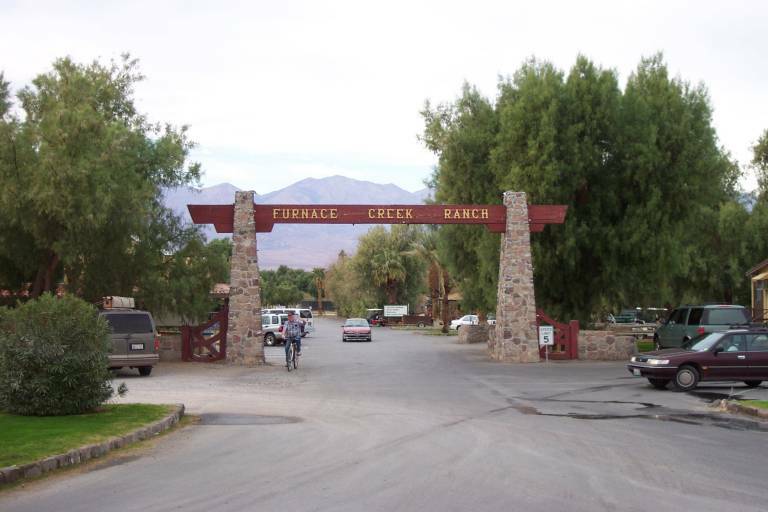 In 1882 the Lee brothers discovered a new form of borax along Furnace Creek Wash. This new mineral was named colemanite after Coleman. A quartz-like ore, it demanded far more complex mining methods than cottonball, but it was far richer in borax. Coleman added these borax deposits to his holdings but he never developed them. His financial troubles in 1888 closed the Harmony Borax Works, and they never reopened. In 1890 Coleman sold his properties to an energetic and successful borax prospector from Teel’s Marsh named Francis Marion “Borax” Smith for $550,000 giving Smith a virtual monopoly on domestic borax production. 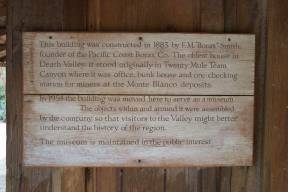 Smith consolidated these properties with his own to create the Pacific Coast Borax Company. 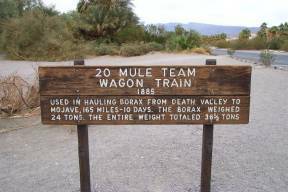 The twenty mule teams solved a transportation problem: between 1883 and 1888 they hauled more than twelve million pounds of borax from remote and inaccessible Death Valley to the railroad at Mojave. 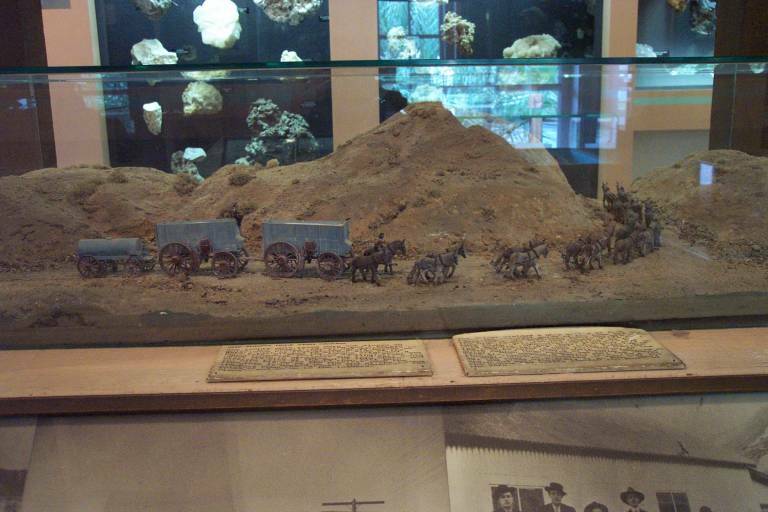 When the Harmony Borax Works was built in 1882, teams of eight and ten mules hauled the ore. But with increased production, the first teams of twenty mules were tried. Stretching out more than a hundred feet from the wagons, the great elongated teams immediately proved a dependable means of transportation. The borax wagons were large and well built. The rear wheels were 7 feet high, the front wheels 5 feet high. Each wheel had a steel tire 8 inches wide and an inch thick. The hubs were 18 inches in diameter and 22 inches long. The spokes were of split oak, the axle-trees were solid steel bars. 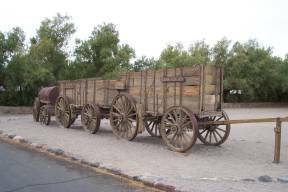 The wagon beds were 16 feet long and 6 feet deep, and could carry 10 tons of borax. Fully loaded, the wagons, including the water tank, weighed 36.5 tons. The distance to Mojave was 165 miles. 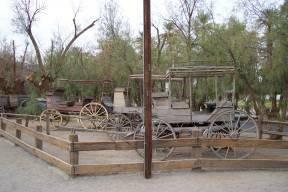 Traveling fifteen to eighteen miles a day, it took ten days to make the trip. After leaving the Valley the teams had to cross 100 miles of empty desert, where many of the overnight stops were at dry camps. Water tanks were therefore attached to the wagons, to supply the men and animals between springs. 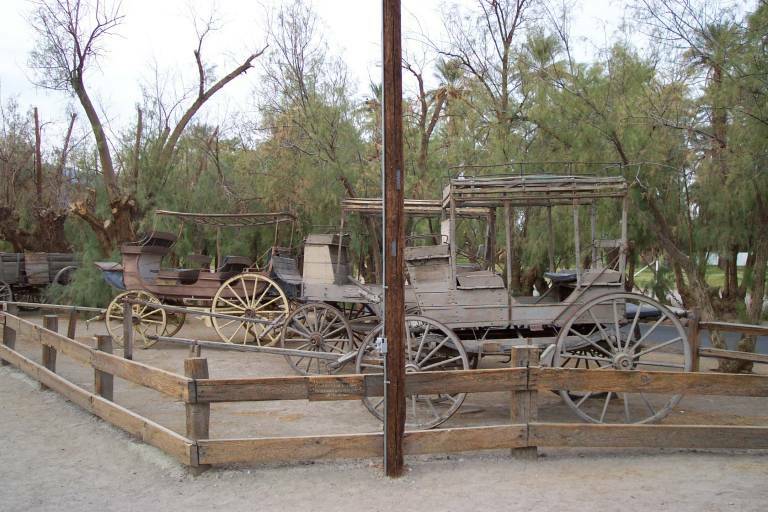 Three men operated these twenty mules teams – in actuality eighteen mules and two horses – the driver who wielded a formidable whip; the teamster, who harnessed and unharnessed the mules, rode one of the horses, and handled the brake of the lead wagon; and the swamper, who rode on the rear wagon, operated its brake on the downgrades, and was chief cook and dishwasher. 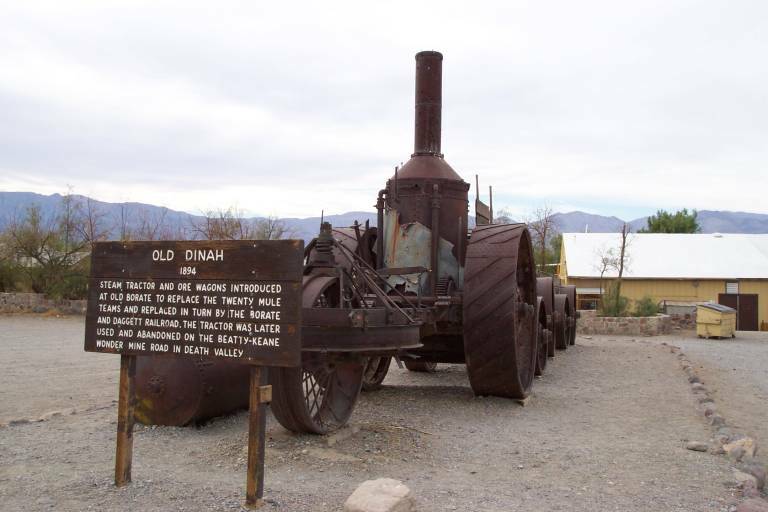 When borax was discovered in the Calico Mountains early in the 1890’s, twenty mule teams hauled the ore from Borate to the railroad at Daggett. Except for the brief interlude when the traction engine “Old Dinah” attempted the job, borax was carried solely by these teams until the Borate & Daggett Railroad was built around 1895. Among those who helped make the teams famous were J.W.S. Perry, PCB superintendent, who organized the first teams and mapped the routes; William Delameter, who constructed the wagons; Ed Stiles, driver of the first team; and teamsters Frank Tilton, Johnny O’Keefe, and “Borax Bill” Parkinson. 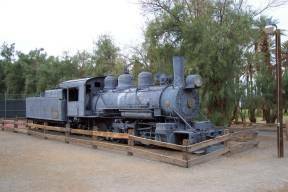 This 60 ton oil burning Baldwin 280 Locomotive hauled borate ore from the mines at Ryan to the mill and main line railroad at Death Valley Junction from 1916 until the railroad was abandoned in 1931. 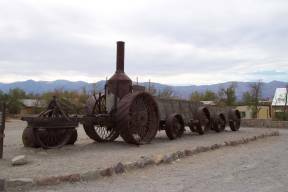 At that time it was sent to the United States Potash Co. in Carlsbad N.M. where it carried ore from mine to refinery for 25 years. 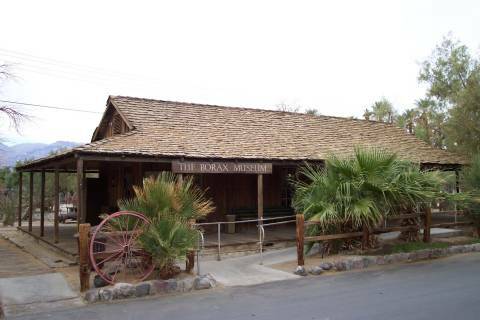 In 1956 it was given to this Museum by the United States Potash Co. now a Division of the United States Borax & Chemical Corporation. The Borax Museum is located at Furnace Creek Ranch, in Death Valley along highway 178, just north of highway 190. See map.